When I first attempted mayurasana (peacock pose), I felt heavy and defeated and quite certain the pose would never become part of my arm balance repertoire. 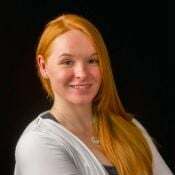 Three years later, I tried again, and with the same results—I couldn’t even get a sense of what mayurasana was supposed to feel like, given my body type (I have a large chest and muscular legs that tended to keep me grounded). And yet, another few years later, I found myself drawn once again to peacock pose. This time, instead of being prepared to blame or turn against myself if I wasn’t able to do it (doesn’t that sound ridiculous? ), I took a different approach. I analyzed the elements of mayurasana and I experimented with various workarounds to create the feeling of being in the pose. And I made some great discoveries in the process. Supporting my shoulders on blocks and pressing my feet into the wall was useful. I also tried baddha konasana (bound angle) and padmasana (lotus) variations, which basically shortened my legs so that I had less lower body to lift. I placed my feet on blocks with extended legs, allowing me to move my elbows into position under my body. I even tried strapping my elbows together. Practicing with my elbows strapped together was hard, but it enabled me to muscle my way up into the pose eventually. Still, after experimenting with lots of props and variations, using a chair was what worked best for me. Doing mayurasana on a chair afforded me the support I needed to focus on alignment, build strength, and, best of all, feel present in the pose. 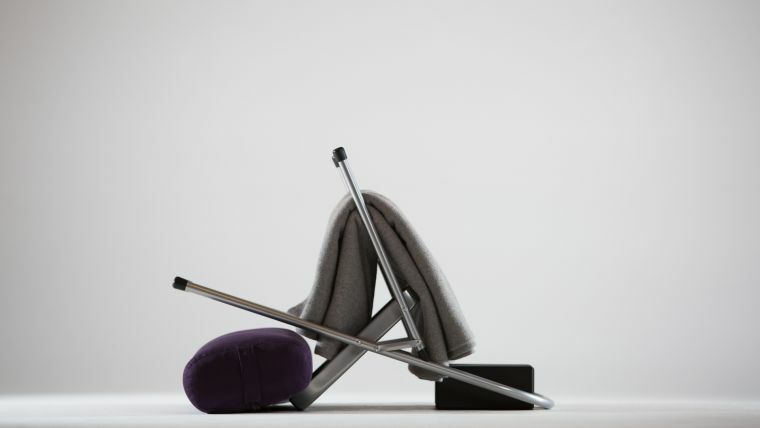 You will need a sticky mat, a folding chair (a backless yoga chair works best), a few blankets, and two blocks. A bolster is optional. 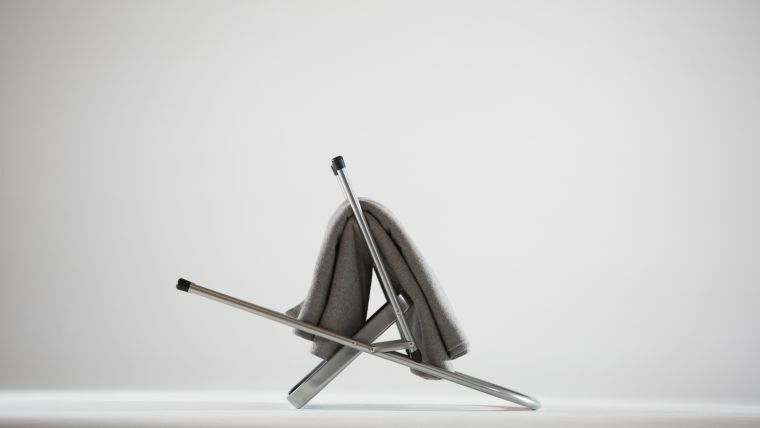 Open the chair and flip it upside down on the sticky mat so that its legs are in the air and the back and seat form an inverted V.
Place two folded blankets on the crossbar between the back chair legs. 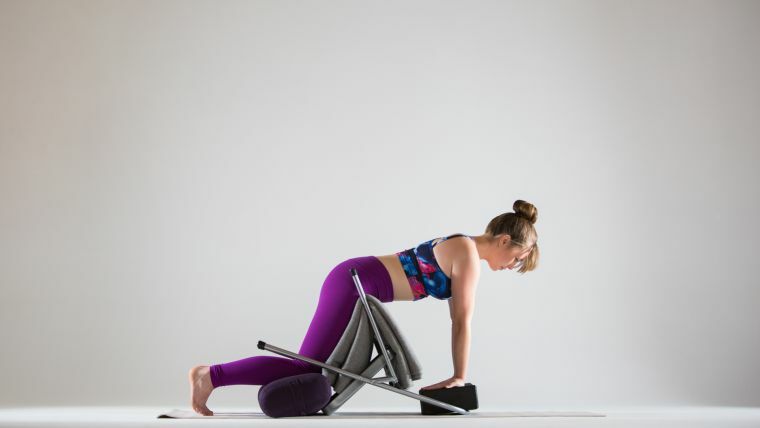 Optional: Placing a bolster up against the edge of the chair seat that’s on the floor will provide padding while you get into and out of the pose. 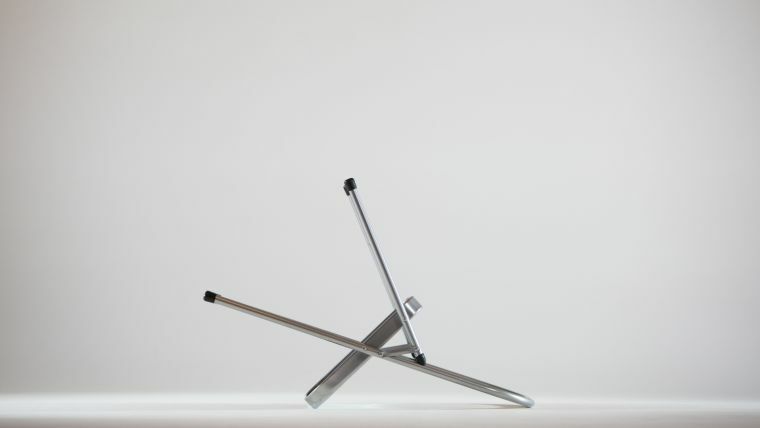 Place the blocks on the floor or on the chair rim (angling them on the chair rim may be kinder to your wrists). The blocks should be close to each other—just how close will vary depending on the proximity of your hands once they’re in position. 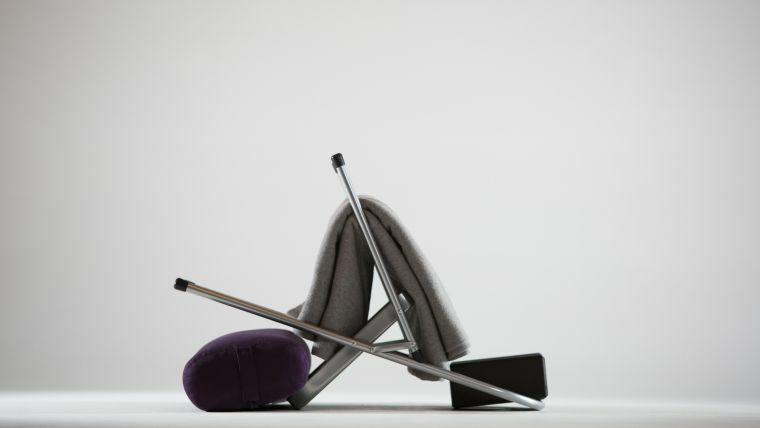 With the bottom of the seat facing you, kneel on the floor in front of the chair (or on the bolster) and place your hands either on the top chair legs or on the crossbar. Lift your knees (keeping the balls of your feet on the floor) as you place your pelvis on the blankets; your hip points are slightly in front of the crossbar. This may take time to finesse, both because of the padding and because of the unfamiliarity of using a chair in this way. If your hip points are too far forward, when you come into the pose you will end up feeling more lumbar (lower back) extension; if the hip points are too far back, your hips will not have enough support to allow you to comfortably lift your legs. Once you find your alignment, make sure you have enough padding under your hips, as you will eventually balance on them. Turn your arms out so that your fingertips face your torso, and place your palms on the blocks with your hands as close to each other as possible. In this position, allow your arms to bend as you work one elbow at a time into your abdomen; keeping your left hand on the block, lift your right hand off the block and wedge that elbow as low into your abdomen as you can (preferably right above your belly button). Repeat with your other elbow. You can also continue repeating this step until you get your elbows as close to each other and as low on your abdomen as possible. It is helpful to wiggle your chest through your upper arms as you position your arms. Hug your elbows in toward each other. With your hands and elbows in place and your hips supported on the bar, lift your legs away from the floor as if you’re coming into salabhasana (locust pose), engaging your hamstrings and buttocks muscles. Your feet can be hip-width apart or wider to start; as you become stronger and more comfortable with the actions, you can begin to draw the legs closer together. Once your legs are off the floor, try bending your elbows more, eventually bringing them into about a 90-degree angle. There are several reasons that being able to support the pelvis in mayurasana, especially in this version, is of critical importance. First, it allows you to feel what it’s like to lift the legs away from the ground. Over time, as I mentioned, the legs will eventually come together. Work on firming the muscles of the legs, sealing the inner thighs together, and spinning the inner thighs up toward the sky (as you would in salabhasana). You can also work other variations, such as bringing the legs into baddha konasana and padmasana. Another reason that pelvic support is important is that it allows you to refine the arms. In the classic unsupported version of mayurasana, the inner forearms touch and the elbows hook under the bottom ribs as the torso leans forward. To refine the action of the arms, you can work on walking the elbows in closer to each other as well as drawing the low belly in and up, engaging your core. In the chair version, I find it helpful to imagine that I’m lifting my hips away from the blankets, which activates the transverse abdominis. In the upper body, the upper back does round, but bring a quality of broadening across the chest by engaging the posterior deltoids and middle trapezius to keep the front of the shoulders from overly rounding forward and the upper trapezius from overworking. Finally, find extension through your body by reaching out through the balls of your feet and the crown of your head. Gaze a few inches in front of you. Mayurasana strengthens the entire body—particularly the wrists, forearms, abdomen, back muscles, and legs—and practicing with the chair helps you to access all the benefits of the pose. I’ve found a new love for this pose by tweaking my thinking on how it needs to be practiced. 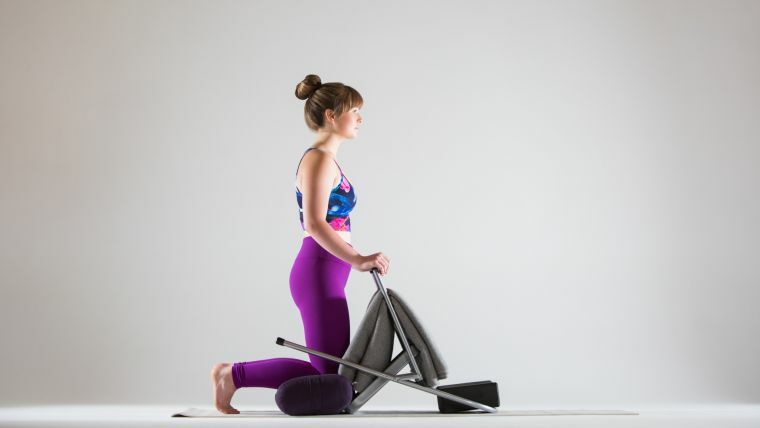 By adding the chair to my toolbox for this asana, I’ve gained a whole new understanding and feeling for it, and I’ve become inspired to revisit less-supported versions. You may find that adding new tools to your asana toolbox may help you as well in uncovering a renewed sense of joy with poses that once left you feeling defeated.